In a major move forward for algae-based biofuel, US feedstock producer Cellana has inked a multi-year deal for commercial-scale quantities. Finnish company Neste Oil, one of the world’s biggest renewable diesel producers, has agreed to buy Cellana’s ReNew Fuel crude algal oil, based on marine microalgae. Cellana is constructing commercial-scale biorefineries around the world for producing its feedstocks. It plans to operate these facilities, and will also use them to produce microalgae-based feedstocks for two other existing product lines: animal feed and Omega-3 nutritional oils. The non-exclusive agreement with Neste Oil is contingent upon several future variables, including production capacity and compliance with EU and US legislation regarding biofuels. Neste Oil says Cellana expects to begin producing algae on a commercial scale starting in 2015. The Finnish company has conducted studies that show algae oil, including Cellana’s feedstock oils, will work in its NExBTL industrial-scale renewable diesel process. Neste Oil also refines petroleum-based oil. ReNew Fuel will extend the range of feedstocks it uses in that process, currently at more than 10. The company is a research partner in several efforts to develop methods for photosynthesis-based algae production outdoors, considered to be more cost effective. The Solar Biofuels Research Centre in Brisbane, Australia hosts one pilot project run by a consortium that includes Neste Oil, the University of Queensland, the government of Queensland, Cement Australia, Siemens, KBR, Karlsruhe Institute of Technology, and Germany’s Bielefeld University. In that project, algae is being grown in both open ponds via photosynthesis and closed tubular bioreactors. Other projects include a joint research program with the Finnish Marine Research Centre to test varying levels and qualities of lipids in different algae types grown under different conditions, and Neste Oil’s own field trials in Spain. Some species of algae grow in salt water and some in fresh water. They’re not all equal when it comes to converting carbon dioxide into usable forms of oil. Other challenges have included the ability to control the production of the varieties that yield high proportions of oil, and to do so at commercial production volumes. The upsides to algae as a non-food feedstock include the fact that it grows much faster than land-based crops, offers high oil yields, and produces more or less continuously in the right environments, compared to a single crop each year from land-based plants. It can also be grown in bio-refineries on land that’s not suitable for food crops. 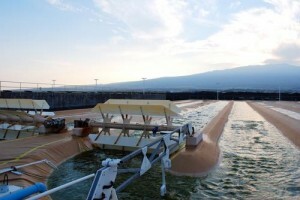 Microalgae such as Cellana uses are among the most prolific types, and marine algae don’t use fresh water, a major criticism of some algae biofuel feedstock attempts. They are also easier and simpler to process because of their small grain size and because they don’t contain lignocellulose, which occurs in most land-based, non-food plant feedstocks. Algae-based biofuels are aimed at transportation fuel applications, especially jet fuels used in military and commercial aircraft. Cellana’s ALDUO process — produced in its six-acre demonstration plant in Kona, Hawaii — has yielded over 20 metric tons of algae biomass. The patented process was developed to enable cost-effective, consistent outdoor production of feedstock on a commercial scale. The company’s ReNew Fuel consists of fuel-grade crude oils that have been extracted from ReNew Algae biomass. This fuel has been tested by commercial-scale petroleum oil producers and refiners, as well as producers and refiners of food crop-based feedstocks and major energy companies.